Larissa Schuster has been sentenced to life in prison for murdering her husband, Timothy Schuster, using a vat of acid. But she didn't need to get any ideas from the movies for the gruesome, high-concept idea. The 47-year-old biochemist co-owned a chemical lab with her husband in Clovis, California, and they were in the midst of an acrimonious divorce. In 2003, Schuster rented a storage unit to settle the score. 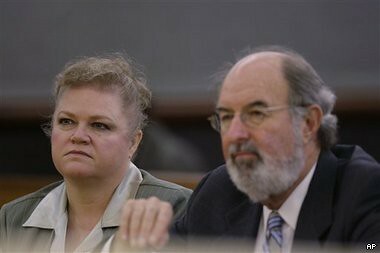 Prosecutors said Larissa Schuster and her former lab assistant kidnapped her 45-year-old husband on July 10, 2003, knocked him out with a stun gun and chloroform-soaked rag, then dumped his bound body head-first into a barrel while he was still breathing. The assistant, James Fagone, told authorities that Larissa Schuster then poured hydrochloric acid into the 55-gallon container. Authorities found Larissa Schuster's handiwork, the half-dissolved remains of her husband ("intact from only the belt buckle down"), a few days after his sudden disappearance from their posh home. Even Larissa Schuster's daughter has no sympathy for her. Kristin Schuster, the couple's adult daughter, told a Fresno County Superior Court judge at today's sentencing hearing that she felt safer knowing her mother would be behind bars. "I've been living for five years not knowing if I would have to worry for my own safety," she said. "In your quest to become a dominating power freak, you became your own demon. You have hurt me for so many years and probably smiled inside, but look who's smiling now."